My family loves this hardy salad. Serve with soup and crusty bread. Preheat the oven to 350°F. Slice the eggplant lengthwise and mix with 6 of the garlic cloves and 1-2 tablespoons of the oil. Spread out on a baking sheet. Season well. Roast until tender - this will take approximately 20 minutes. Meanwhile, grill the peppers until well blackened. Cover with a tea towel and leave to cool. Then remove the skins and cut into strips. Whisk the balsamic vinegar with the remaining oil in a large bowl, peel and chop the remaining garlic and add to the bowl. Mix in the eggplant and peppers, scallions and olives. Taste for seasoning. 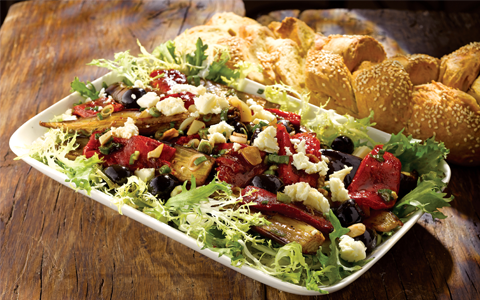 Tear up the salad leaves, arrange on a large platter, top with eggplant mixture and sprinkle with cheese.